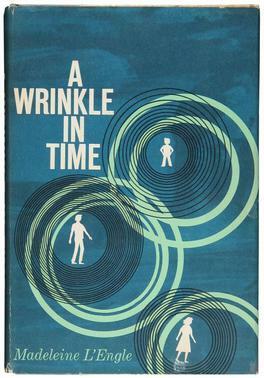 Okay, true confession time: I had never read A Wrinkle In Time before. It's always been kicking around the bookshelves of the Parentals, but for whatever reason I never actually picked it up and read it as a kid. (Which is kind of unusual, because I read just about everything else I could get my hands on as a kid.) But with the release of the movie (which I didn't see when it was in the theaters, but I will probably get around to- at some point) made me get the itch to read the book before I watched the movie. Meg Murry is smart, but she's always getting into trouble in school. Her little brother, Charles, is spooky smart. Her twin brothers Sandy and Dennys are probably are the most normal of the bunch. Her father has been missing for a couple of years now, vanished in some kind of secret government project and just as the family is beginning to think they're never going to see him again, in the middle of a dark and stormy night, Meg comes downstairs to find her little brother eating a snack with their new neighbor, the eccentric Mrs. Whatsit. When Mrs. Whatsit casually mentions that 'there is such thing as a tessarect', their mother, Mrs. Murry is shocked. Soon enough, Calvin another neighbor boy, Meg and her brother meet up with Mrs. Whatsit, Mrs. Who and Mrs. Which that sweep them away to another planet via use of the fifth dimensional travel method known as 'tessering.' The planet, Uriel is an Utopian world filled with centaur like beings who live 'in a state of light and love.' The three Mrs. W's reveal that the Universe is under attack from an evil being called The Black Thing that's consuming planets. They then take the children to visit another being, The Happy Medium, who shows them Earth. Earth is partially covered by it's darkness, but the great religious figures, philosophers and artists have been fighting against it's power. The children then travel to the planet of Camazotz in search of Meg's father. Camazotz is a planet that has surrendered to the power of The Black Thing. Everyone is under the control of a single mind, the centralized hive mind known as IT. It attempts to take over their minds, but Calvin and Meg resist. Charles, on the other hand, believes he can resist IT long enough to locate their father, but is consumed by the mind instead. Under it's control, he takes them to where their father is imprisoned. Meg and Calvin free their father and in desperation as IT begins to break down their defenses the three of them tesser away, leaving Charles behind. They have to tesser through the Black Thing that surrounded Camazotz, which nearly kills Meg, but they land on the neighboring planet of Ixchel, where Meg is revived by one of the inhabitants, whom she names Aunt Beast. She heals and as she does so, she overcomes her anger at her father for abandoning Charles back on the planet and makes peace with the idea that grown ups can't fix everything. Mrs. Whatsit, Mrs. Which and Mrs. Who show back up and tell Meg that she's the only one who can get Charles back. He was a baby when her father disappeared and Calvin has only just met him. Meg goes back, armed with gifts from the three Mrs. W's and successfully frees Charles Wallace and then they're tessered right back into their garden safe and sound back on Earth. Before the Mrs. W's could tell them what they were up too, they vanish.